Soonae Tark (b. 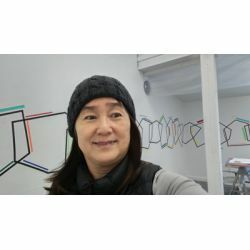 South Korea) continues to exhibit her reductive, colorful geometric work in galleries, museums, and public spaces. Her list of awards includes a Pollock-Krasner Foundation Grant, an Adolph & Esther Gottlieb Foundation Grant, a National Academy Museum Abbey Mural Painting Fellowship, and an Individual Artist Initiative Award from the Queens Council on the Arts. She completed two compelling permanent public art for the City of New York. Her work has been reviewed by The New York Times, The Philadelphia Inquirer, New Jersey- Herald News, Louisiana Magazine-The Advocate, Queens Chronicle and many others. She has her BFA from Dongduk Women’s University in Seoul, Korea and her MFA from the École Nationale Supérieure des Beaux-Arts de Lyon, France. Soonae lives and works in New York City.